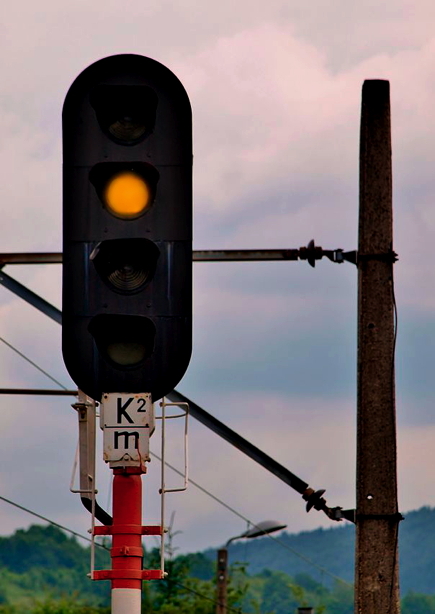 Junction colour light signal. From a photo by Henryk Żychowski. 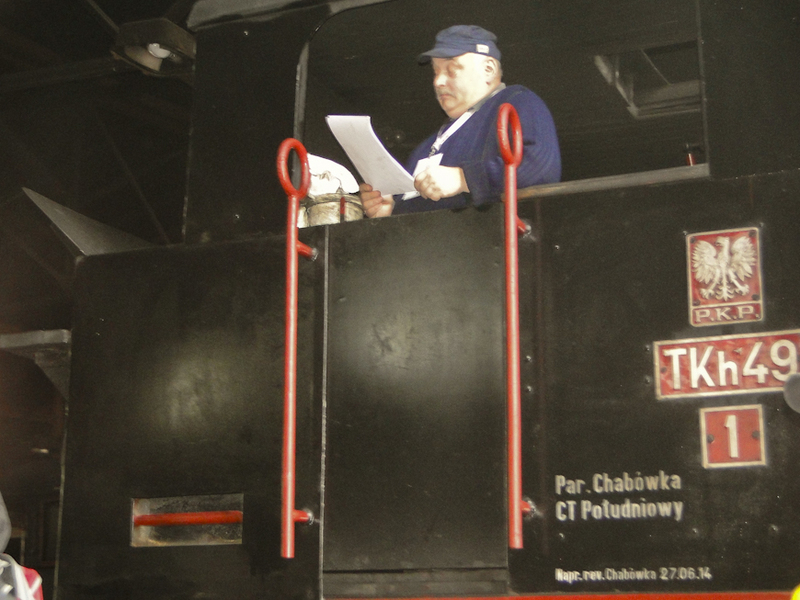 Thanks to the efforts of Howard Jones – who created the ‘Wolsztyn Experience’ and negotiated an agreement to market footplate passes to international railway enthusiasts – daily steam passenger services (with occasional interruptions) have survived for some 17 years since the end of regular steam haulage on Poland’s railways. A proportion of Wolsztyn Experience’s revenues helps to subsidize the running costs of the shed and the repair of individual locomotives. Wolsztyn Shed is the last such installation in Europe and most certainly in the Northern Hemisphere. Visitors come from all around the world and contribute an estimated 1 million Euro to the Wielkopolska economy. Howard Jones, himself, was awarded the MBE for his efforts. 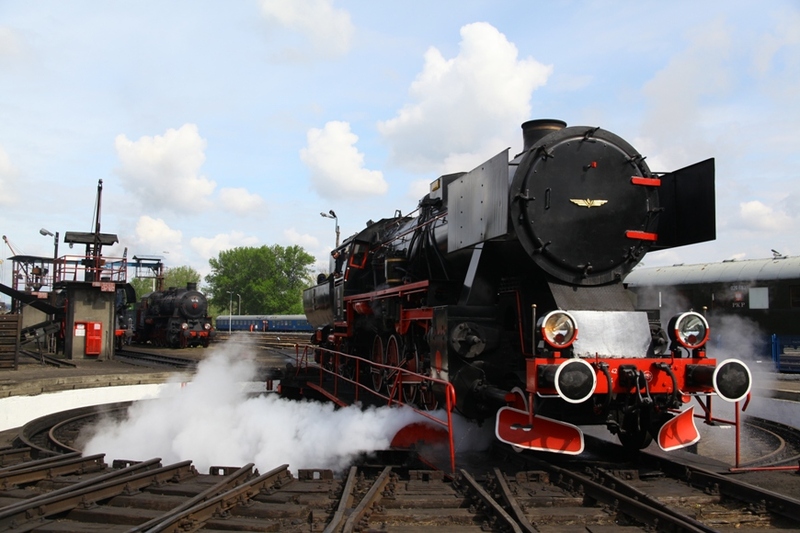 Since March this year, the daily steam workings have been suspended and the Wolsztyn locomotives have only been steamed spasmodically mainly to haul the Turkol specials. 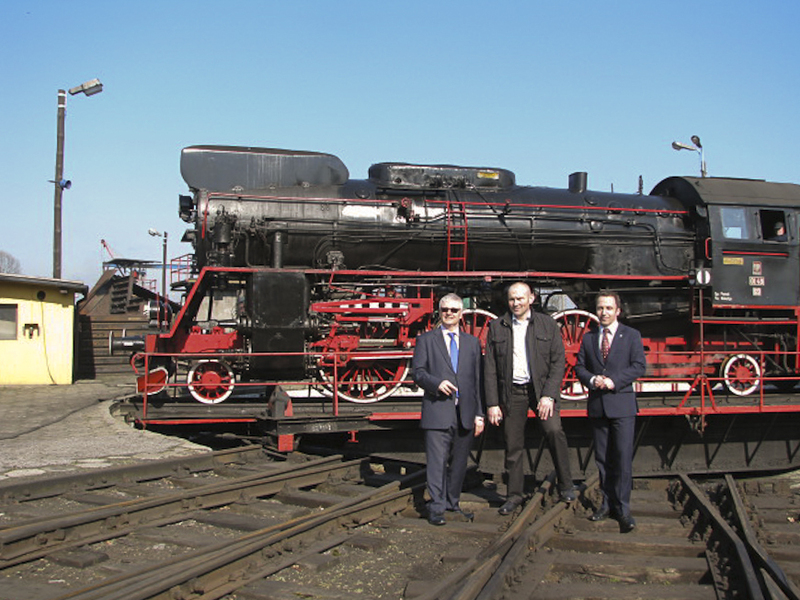 Meanwhile the principle stakeholders: the Chief Executive (Marszałek) of Wielkopolska Province, PKP Cargo, Koleje Wielkopolskie (Wielkopolska Railways) and the Mayor of Wolsztyn have been hammering out a deal to create a new organisation to run manage the shed and its locomotives in the future. Now, at last, an agreement in principle has been reached, the formal documents are being drafted, and – after several postponements – early September has been announced as the time when everything is to be signed and sealed. The depot will be managed by a new body with the legal status of a cultural foundation. The foundation will be able to accept and seek grants and donations and, if well-managed, should ensure that the future of the shed is secure. This scheme has received the backing of Brian Simpson, MEP, when he was chair of the European Parliament’s Transport and Tourism Committee. 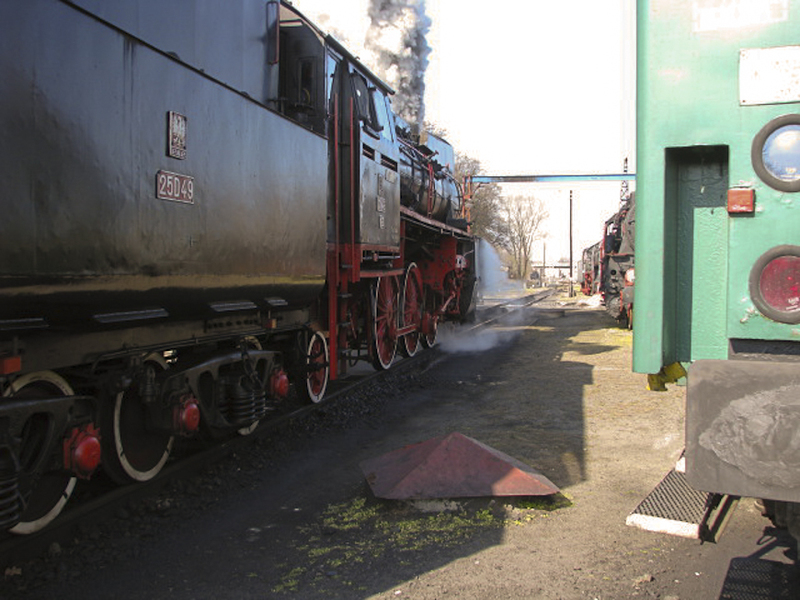 But while the future of the Wolsztyn Shed would seem to be secure, the future of the daily steam services may be less so. One of the stakeholders, Koleje Wielkopolskie (controlled by the Marszałek), is less than enthusiastic about the daily steam workings (the feature that made Wolsztyn unique) and would prefer steam operations to be restricted to a limited number of special trains and the attitude of the Mayor of Wolsztyn is said to be ambivalent. BTWT readers have already sent many letters about the future of the Wolsztyn steam workings. Maybe now is the time the one last letter? 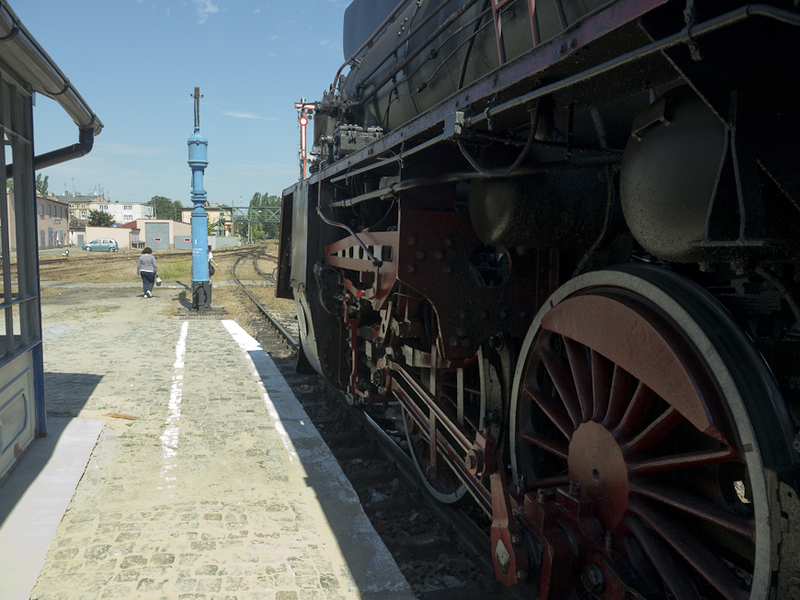 It would be opportune to congratulate the key players on the progress achieved so far towards securing the future of the shed, and at the same time pointing out that, without a daily steam service, Wolsztyn is just another – not very special – railway museum. Wolsztyn – The Final Parade? Ty42-24 passing through the signals on the erstwhile line to Konotop. Photo Marek Ciesielski. Wolsztyn’s annual May parade took place on 3 May. A much smaller event than usual, which has cast doubts on whether or not the event will continue. No German based locomotives were present. 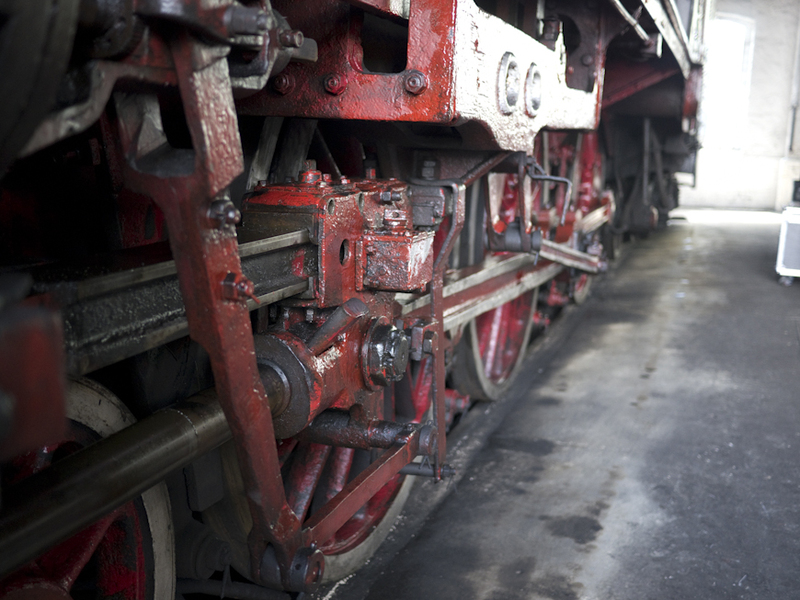 Poland’s fractured rail industry appears to have put paid to that. From what we understand, faced with swingeing track access charges and other fees, the German railtours could not break even for a sensible fare. Given that the fees levied on last year’s trains led to them making a loss, a decision was made by German railtour organisers not to risk making further losses this year. Chabowka based Ty42-107 and TKt48-191 during the Parade. Photo John Savery. 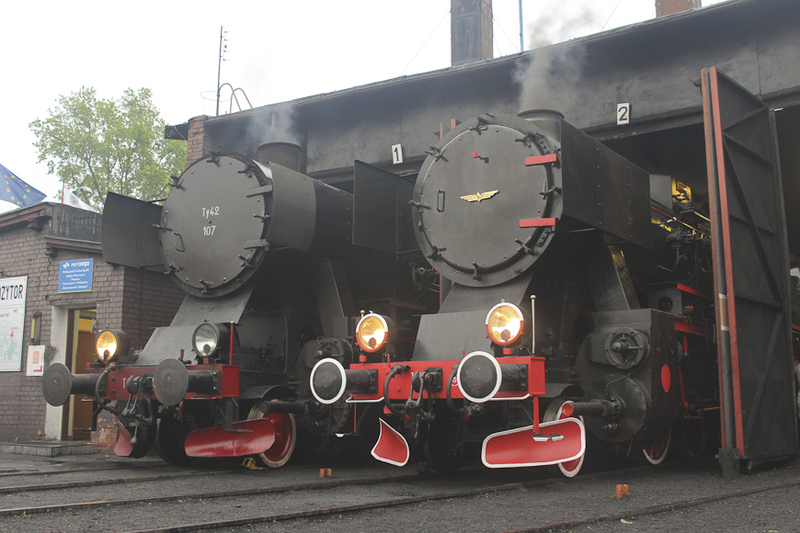 Chabowka supplied 3 in ticket locos: Ty42-107, Ol12-7 and TKt48-191, all being moved from their southern Polish base. Wolsztyn could only muster 2 in ticket locos, Ol49-59 (making it’s last appearance before overhaul at Leszno), and Ol49-69. Quite why PKP allows Chabowka to keep 3 locos in working order (with the boiler for the OKz32 also standing by ready to fit) compared with Wolsztyn’s single remaining loco is beyond reason, given that the number of steamings and charters done by Chabowka is minimal, and is probably worth an article on its own. 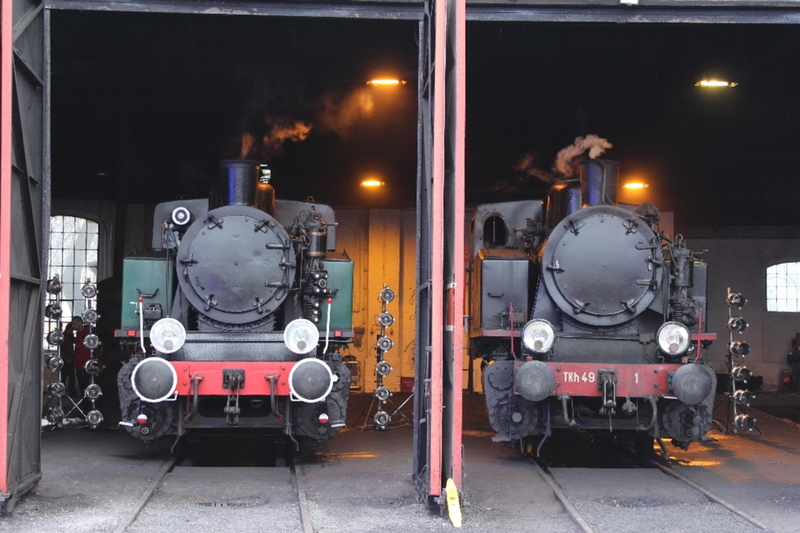 Chabowka’s Ty42-107 and Pyskowice’s Ty42-24 in the shed at Wolsztyn. The devil is in the detail! Photo Marek Ciesielski. Pride of the show was Ty42-24, restored in Pyskowice by Zbyszek and Krzysiek Jakubina. Making its debut at the Chabowka gala last year, the standard of restoration is exemplary, and the quality of the finish is far superior to that on Ty42-107, overhauled by full-time staff at Chabowka. Also present were a Czech loco (2-8-2 Mikado 475- 179) and Club Albatross’ Slovakian 4-8-2 498-104. Slovakian 498-104 during the Parade, 3 May 2014. Photo John Savery. Despite optimistic reports in this month’s Railway Magazine, there are no firm guarantees that steam will actually return to the daily services. As yet no deal has been reached, however it is clear that the lobbying by concerned supporters is hitting the mark. 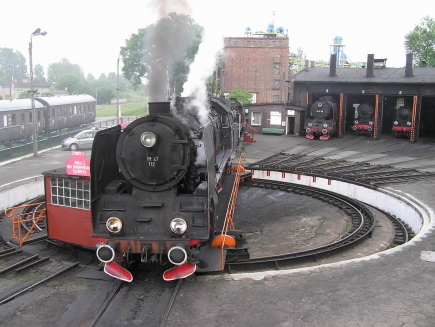 From what we have heard, at least one letter prompted by the appeal in BTWT has actually reached Jakub Karnowski, the boss of PKP, and he has charged the team looking at the Warsaw Railway Museum project to also look closely at the situation in Wolsztyn. With the sun glinting off the gleaming paintwork, Ty42-24 prepares to return south to Wroclaw. Photo John Savery. A team in PKP Cargo’s strategy unit is now working on a business plan to set up a cultural institute to take over long-term responsibility for the shed and its locos. In the meantime, it is probably not a bad idea to keep up the pressure! If you were thinking of writing a letter, but have not already done so why not drop a line to one or both of the people below. Physical letters are best, but you could also send a pdf file version of a properly formatted letter as an e-mail enclosure. 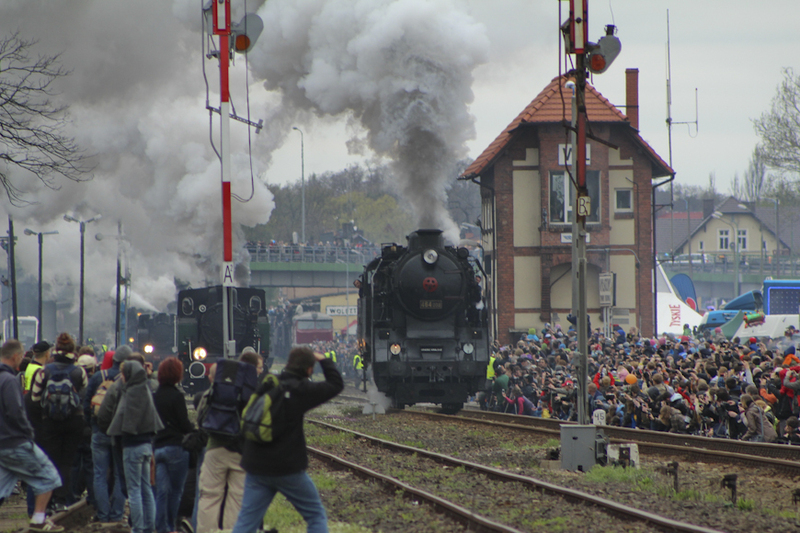 We believe that the cultural institute idea deserves support, however it is important to point out that what made Wolsztyn absolutely unique was the daily timetabled regular passenger service, hauled by the steam engines stabled there, and that it was this that attracted visitors to Wolsztyn from all around the world. Wolsztyn plan gets EU chair support! PT47-112 at Wolsztyn. Photo Hubert Smietanka. CC2.5 licence. 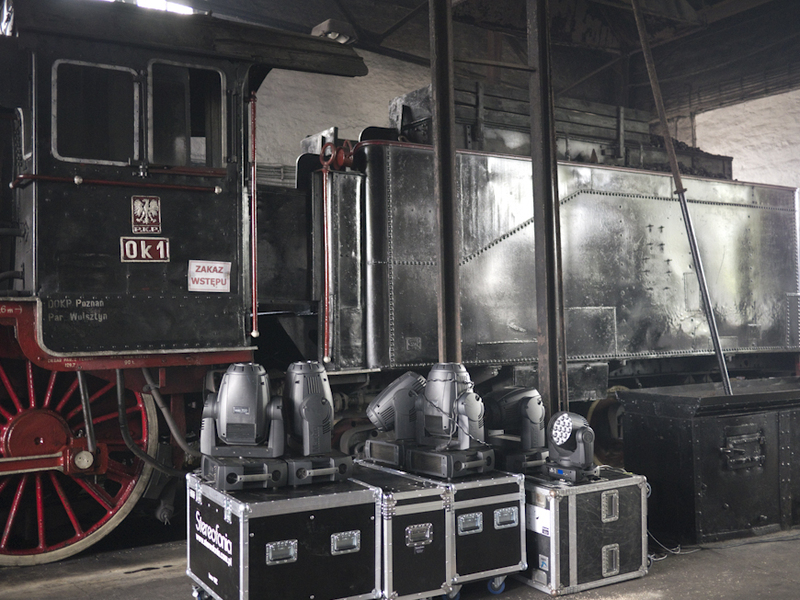 Brian Simpson, the chair of the European Parliament’s Transport and Tourism Committee, has entered the battle to save the Wolsztyn engine shed, and its daily timetabled steam workings. Mr Simpson has sent a detailed letter to Adam Purwin, the new boss of PKP Cargo, strongly supporting the idea that a new entity be created to be the long-term custodian of Wolsztyn and that the new entity take the form of a cultural institute. The idea of a cultural institute is the third iteration in the development of ideas for the long-term future of Wolsztyn in over three years. BTWT has had an opportunity to talk to the people who are working on the plan at PKP HQ in Warsaw, and the plan seems the best solution yet. 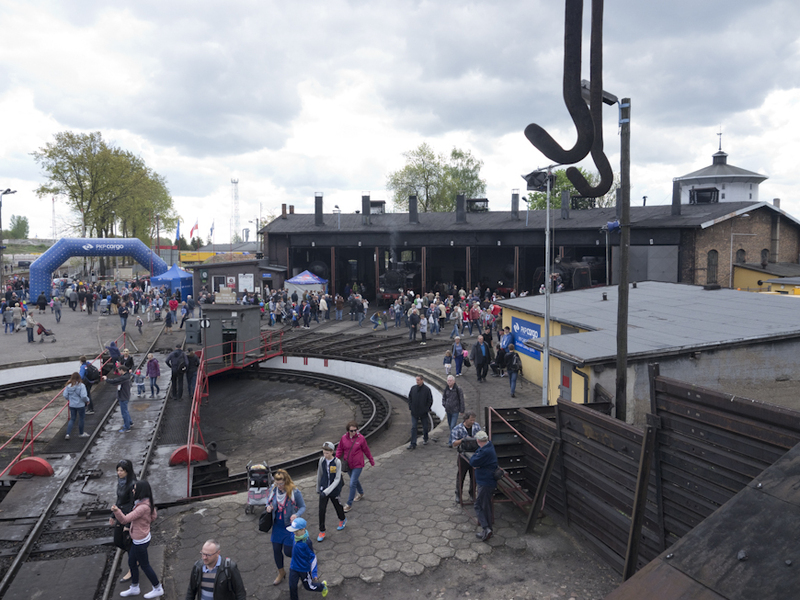 Previous plans for the long-term future of Wolsztyn envisaged setting up a company for the specific purpose of operating the shed and maintaining the locomotives used for the daily steam trains. The main drawback of the plan was that the company would have operated with the legal status of a commercial entity – precluding certain kinds of donations and financial support. A cultural institute, could be the beneficiary of all sorts of grants and donations – including EU support – that would be not be available to a commercial entity. Friday’s meeting between representatives of PKP Cargo and the Wielkopolska provincial government ended without agreement. No further talks are scheduled until 18 April, and with no agreement, steam services will cease on 31 March. Ol49-59 has the dubious honour of hauling the last service, the afternoon Wolsztyn to Leszno turn. After that the loco will return light engine to Wolsztyn with the return passenger working being completed by a diesel railcar. Behind the Water Tower does not intend to sit idly by until 18 April. We encourage people to write to the main parties concerned and encourage them to work out a deal. There is time for written representations to be delivered before 18 April. A well written posted letter may carry more clout than an email and we would urge people to put pen to paper in the next few days so that it reaches the relevant parties before the meeting. With elections looming our editorial team have already heard from people who have openly said that the current incumbents will not be receiving their vote given the current standoff. There may be an element of politics at play in all this. Who knows? The Wielkopolski Marszalek may be planning to pull a rabbit out of the hat and save the steam services as part of his election campaign. We hasten to add, that is pure speculation, however, if that is part of the strategy, it is a dangerous game to play. Former PKP Cargo Chairman, Lukasz Boron. Photo PKP Cargo. Shortly after sacking PKP Cargo boss, Lukasz Boron, PKP SA Chairman, Jakob Karnowski, launched a drive to introduce a code of ethics across the whole of the PKP Group. Each PKP subsidiary is to have its own code of practice and a person responsible for making sure that it is implemented. A senior project manager, reporting direct to Karnowski, will oversee the whole process. ‘Spanish customs’ were once common in PKP. It was not unknown for regional heads in the infrastructure company, PKP PLK, to run their own track maintenance companies employing PKP PLK staff and bidding for PKP PLK contracts. Conflicts of interest were rife. Some PKP Cargo bosses had shares in Cargosped, a logistics company that bid for freight haulage contracts in competition with PKP Cargo. Industry sources claim that the wagon standing time scam is still common. PKP Cargo customers are charged for the amount of time wagons are left in sidings waiting to be unloaded, certain Cargo officials are happy – in return for a small consideration – to book a lower amount of standing time. 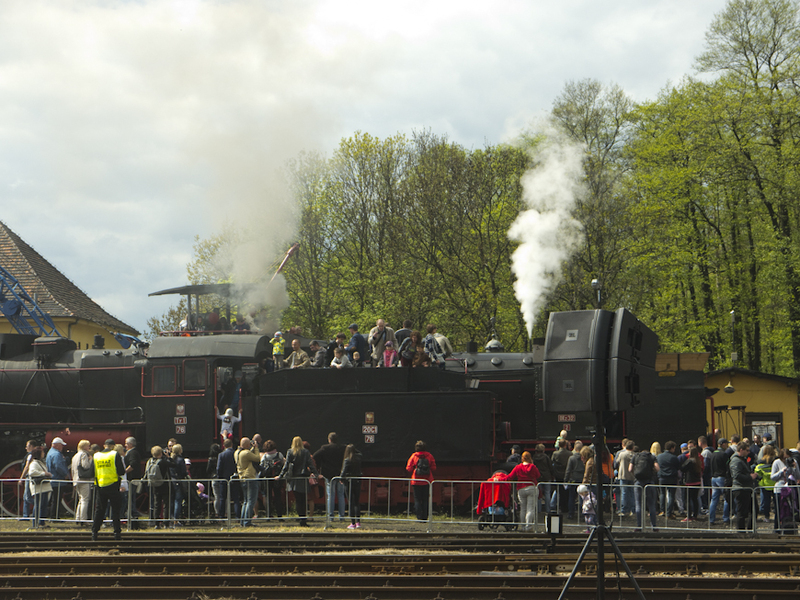 The ‘all hands on deck’ highlight of the 2013 Wolsztyn Steam Gala, Video by lukas125p . There are TWO ‘mainline’ steam galas in Poland: the well publicised Parada Parowozow which takes place each year at Wolsztyn and the less well known Parowozjazda at Chabowka. 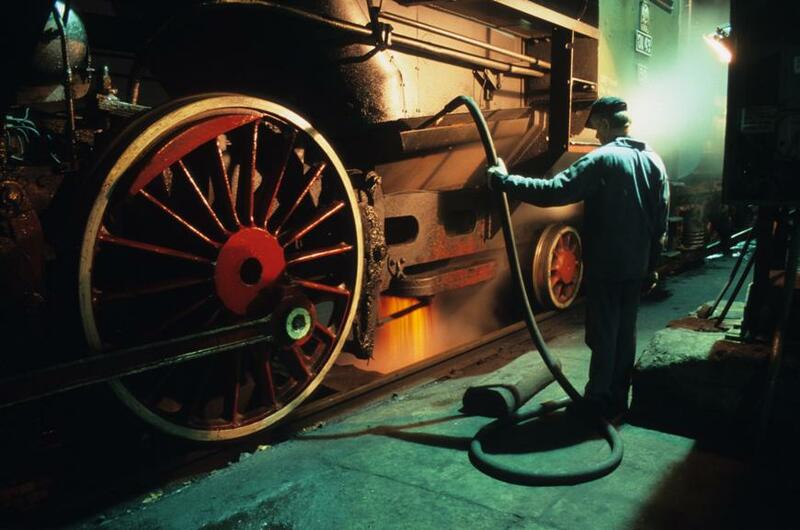 The Wolsztyn Gala, whose 20th anniversary was celebrated on the 27 April this year, is undoubtedly the event which is responsible for keeping working steam locomotives in the public eye in Poland. 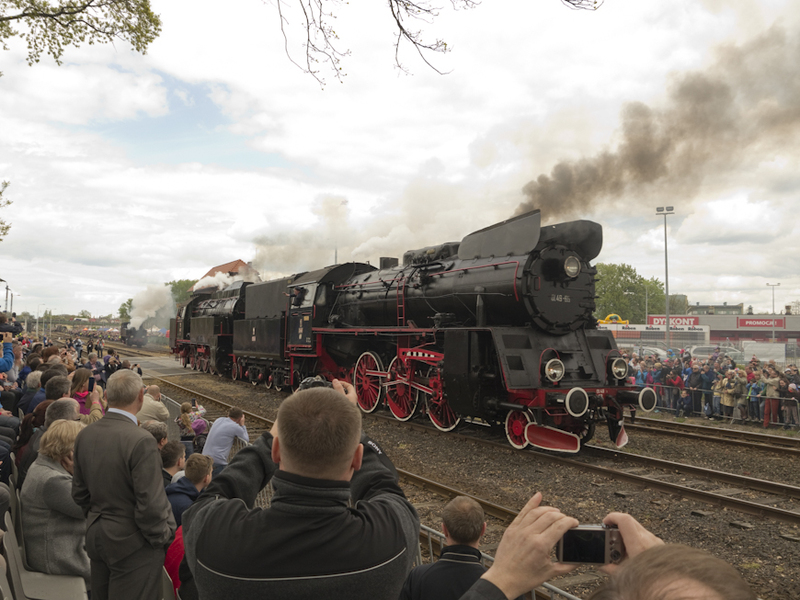 The Chabowka event deserves to be better known offering as it does the sight of a parade of vintage trains – freight and passenger – rather than just steam locomotives. 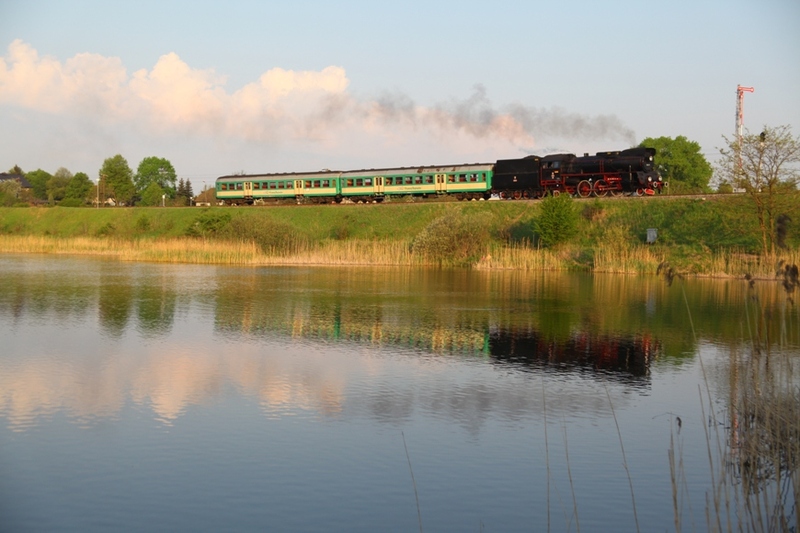 A couple of steam specials offering photos stops for enthusiasts are also run on the Chabowka – Nowy Sacz line as far as Dobra k. Limanowej. 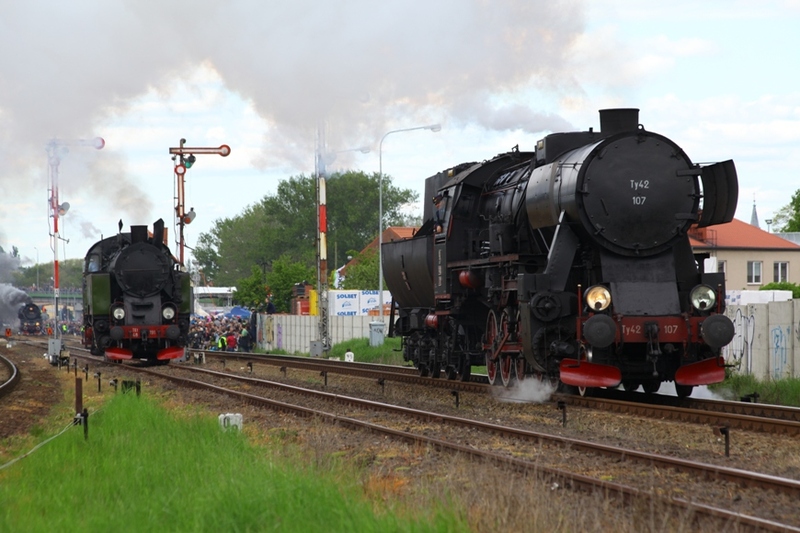 This year, the Chabowka gala is due to take place on 24 August and with the Nowy Sacz line on PKP’s closure list it may be the last year that steam specials operate over that line. Highlights of the 2012 Parowzjazda. Video by rafstak. Sadly, because of the lack of support from local councils, and lack of imagination from those responsible for marketing the event to potential stakeholders, Parowozjazda is now a pale shadow of days gone by. 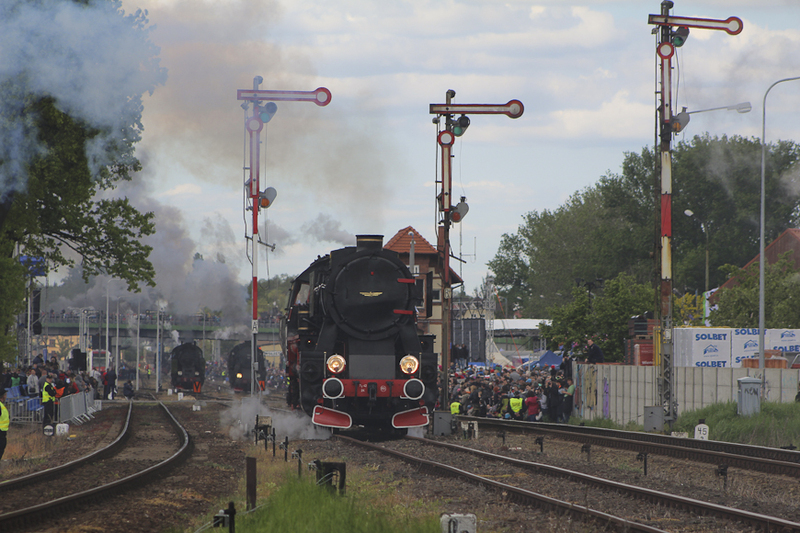 Not so long ago, connecting specials ran from Cracow and Zakopane while the parade of vintage trains took place at Rabka Zaryte. Today, the sidings at Rabka Zaryte have been lifted and Parowozjazda takes place within the confines of the Chabowka ‘Skansen’. 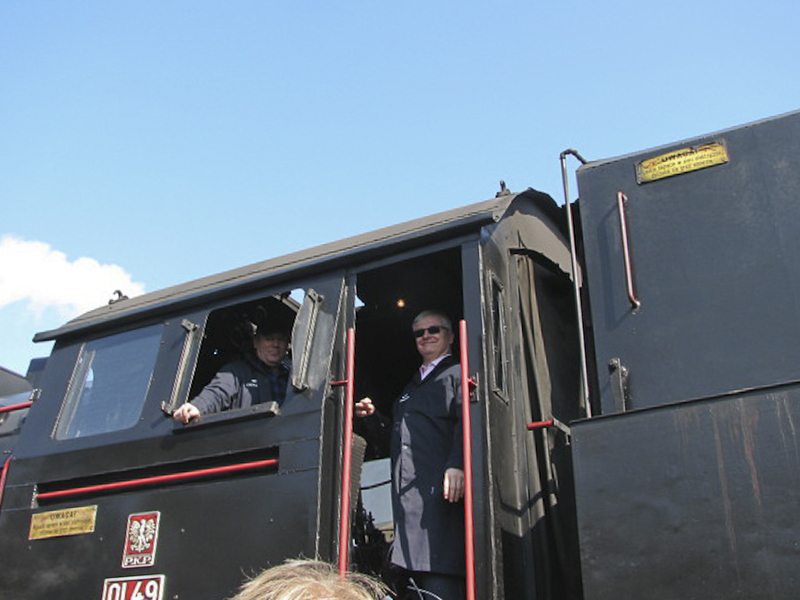 With a hat tip to Mike Stollery of the Swanage Railway. On the left DB Schenker owned Tkh 5353, built Chrzanow 1953; on the right Tkh 5695 (carrying the number Tkh49-1) from Chabowka, built Chrzanow 1961. Photo Marek Ciesielski. In spite of the clouds and rain, the 20th annual Parada Parowozow held at Wolsztyn over the weekend 27/28 April was an outstanding success. In the intervening months, the wind seems to have changed. Maybe someone whispered into the ear of Cargo senior managements that this was to be the 20th steam parade, and the last to be held before PKP Cargo is privatised by a share floatation on the Warsaw stock market? 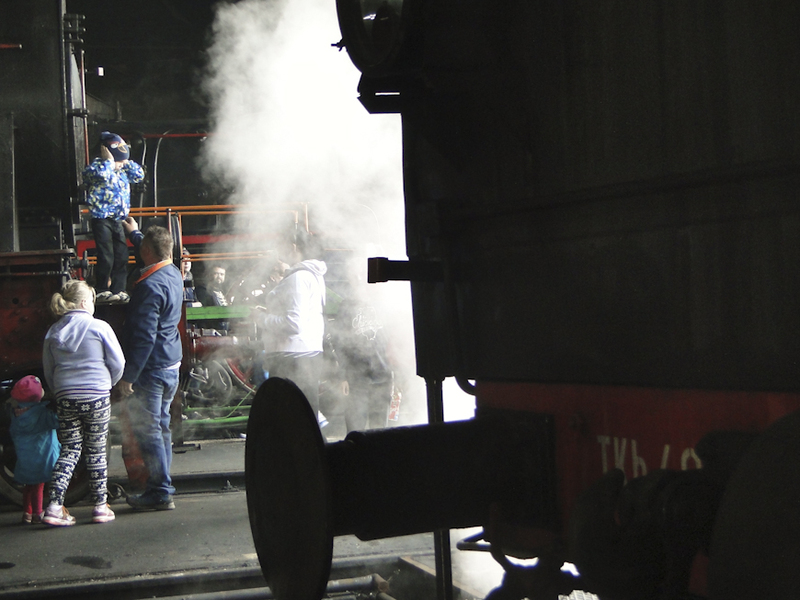 The two Tkh locos and 4-8-4T 464-008 from the Czech Republic steam towards the station. Photo Marek Ciesielski. Money was evidently found, and Cargo set itself the target of having 20 engines in steam at the event. In the end they were some half dozen engines short, but neither this nor the bad weather seemed to damp the spirits of the huge crowd who came to watch the parade, or ride on the record number of steam trains organised by TurKol. The fireworks and lightshow were moved from their traditional slot on Friday evening to Saturday evening guaranteeing that many people stayed on till late. Significantly as the event drew to a close, the chairman of PKP Cargo was seen to confer with the Chief Executive of the Wielkpolska provincial government and local Cargo managers. 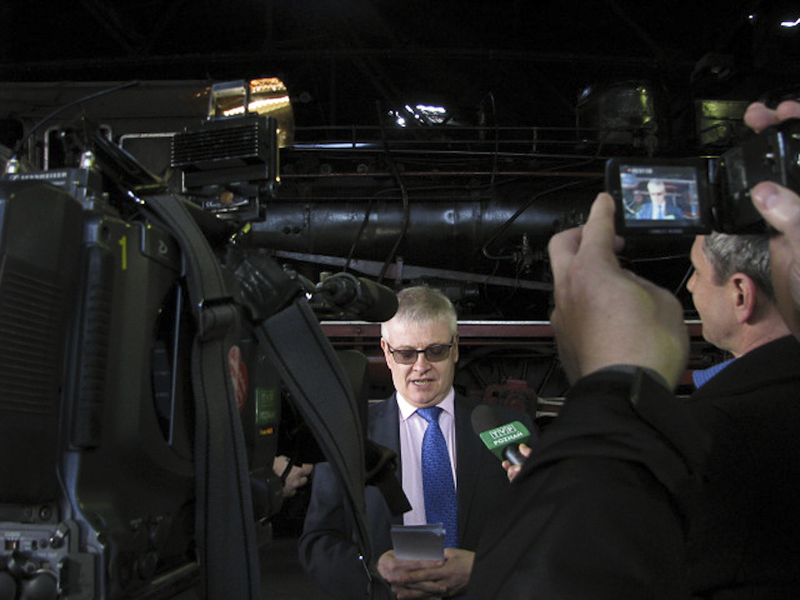 Hopefully a sign that a deal to secure not only the steam depot, but also its unique ordinary passenger schedule steam trains, may well be on its way. Łukasz Boron. From a photo by PKP Cargo. 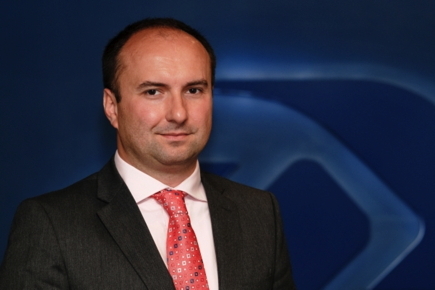 On Monday 25 January, the PKP group announced that Łukasz Boron, the former Finance Director of PKP Cargo, has been appointed the Company’s new chairman, filling the vacancy caused by the resignation of Wojciech Balczun. Adam Purwin, previously tipped for the top job in Cargo, and currently heading the PKP SA department responsible for privatisation strategy, moves into the Finance Director job vacated by Boron. 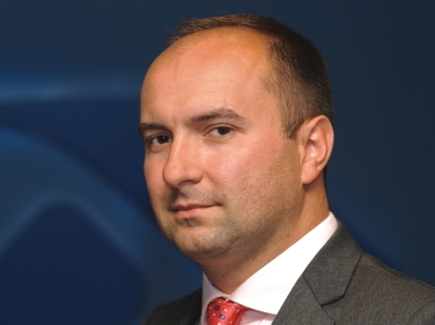 Acting Chairman, Marek Zaleśy, formerly Sales Director retains his membership of PKP Cargo’s board. At Monday’s press conference, Boron announced that his intention would be to continue the good work started by his predecessor Wojciech Balczun in getting PKP Cargo ready for its début on Warsaw’s stock exchange. At the end of January, Transport Minister, Sławomir Nowak authorised the partial privatization of PKP Cargo by the sale of up to 50% of the shares of PKP Cargo. PKP SA is to retain a controlling interest in PKP Cargo. Boron announced that he had identified three priority areas. The first of these was ‘consolidating’ Cargo’s existing markets: carrying steel, coal and aggregates. This is a sector where Cargo has lost traffic thanks to the heavy engine / long train tactics of new competitors such as DB Schenker and Freightliner PL. The second was expansion into fast growing new markets such as biomass and intermodal, including expansion abroad, not only into the countries that are Poland’s immediate neighbours, but also further afield as far as Hungary and Holland. The third was to continue streamlining the company and cutting costs. 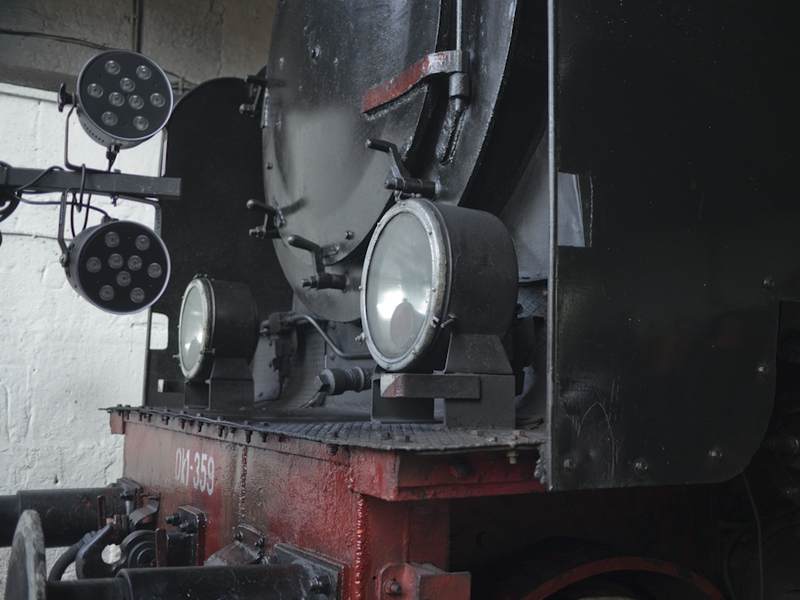 Łukasz Boron has worked in the railway industry for 8 months. He is a mergers and acquisition specialist having worked for four years in that role with KPMG Corporate Finance, then from 2011 he headed the M&A department of Erste Group Bank AG Investment Banking in Vienna. Former PKP Cargo boss Wojciech Balczun. Photo Shalom. 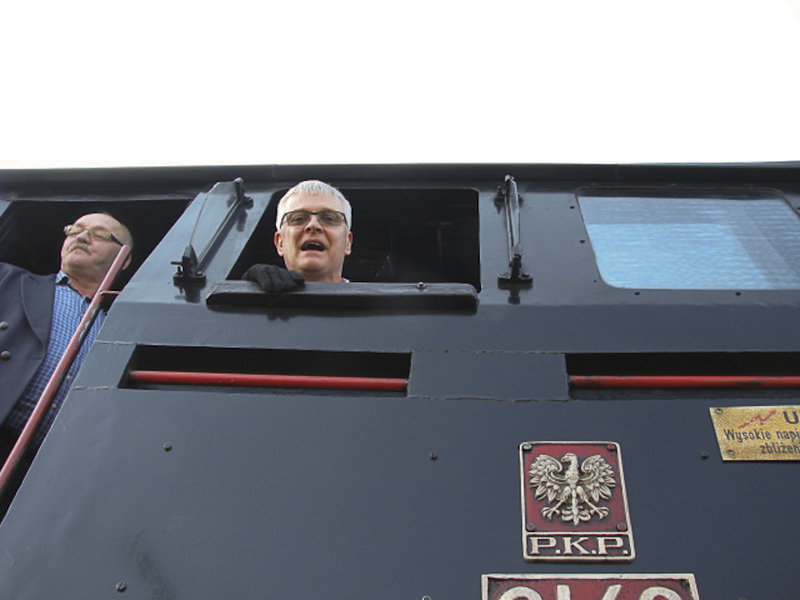 PKP Cargo Chairman, Wojciech Balczun, resigned today from the job of leading Poland’s largest rail freight carrier. The shock resignation is reportedly the result of Balczun receiving an offer of a lucrative post with a major international company. Balczun will work out his three month notice with PKP Cargo and will help the company choose his successor. Balczun has been in charge of PKP Cargo since January 2008. Prior to that, in the years 2005 – 2007, he was the Chairman of the main board of PKP SA. In 2008, the Cargo’s loss amounted to 178.8 million PLN. After major restructuring, which involved reducing the headcount from 44 k to 24.5k, he turned the company round and it is expect to declare a profit of 340 million PLN for 2012. As Cargo prepares for an IPO on the Warsaw Stock Exchange, Balczun has emerged as one of the most able bosses in the PKP family and one that the state-owned group can ill afford to loose. China Railways CRH5 at Qinhuangdao. Photo 颐园新居. Poland’s Transport Minister, Slawomir Nowak, has concluded a 5 day official visit to China. The visit took place at the invitation of China’s Transport Minister, Li Shenglin. 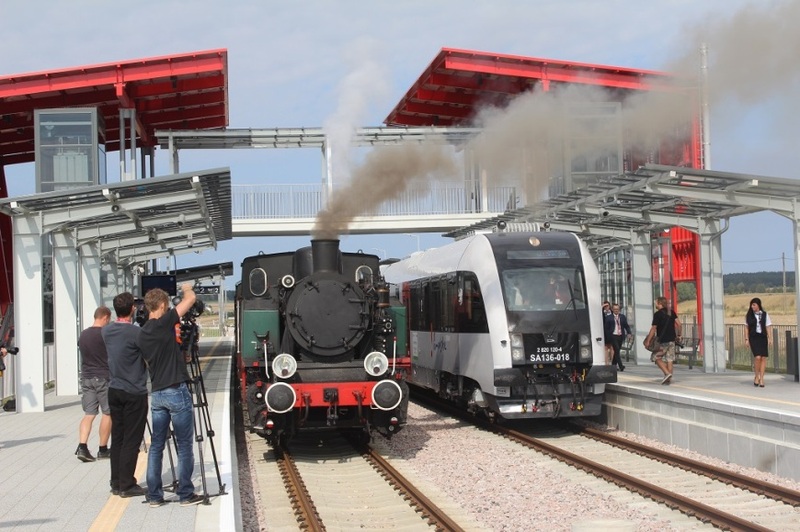 The Polish delegation included Poland’s rail minister, Andrzej Massel, and the head of Poland’s Information and Foreign Investment Agency (PAIiIZ), Sławomir Majman. Other members of his delegation included representatives of PKP PLK, PKP Cargo, LHS, DCT, and the ports of Gdansk, Gdynia and Szczecin-Swinoujscie. In China key meetings took place with the Deputy Minister for Trade, Zhong Shanan, and the Deputy Minister of Transport, Weng Mengyong, Other important meeting took place with representatives of some of China’s largest transport companies : China Shipping Container Lines, Cosco Shipping Line & Cosco Freight Forwarding Company, Shanghai Electric and the GeoHarbour Group. Is it significant that meetings appear to have only taken place at deputy minister level? The official website of the Chinese Ministry of Foreign Affairs and the Chinese Transport Ministry – always keen to promote China to the rest of the world – are strangely silent on Nowak’s visit. The purpose of the visit was to promote Poland as an attractive country for investment and a good place to do business in. 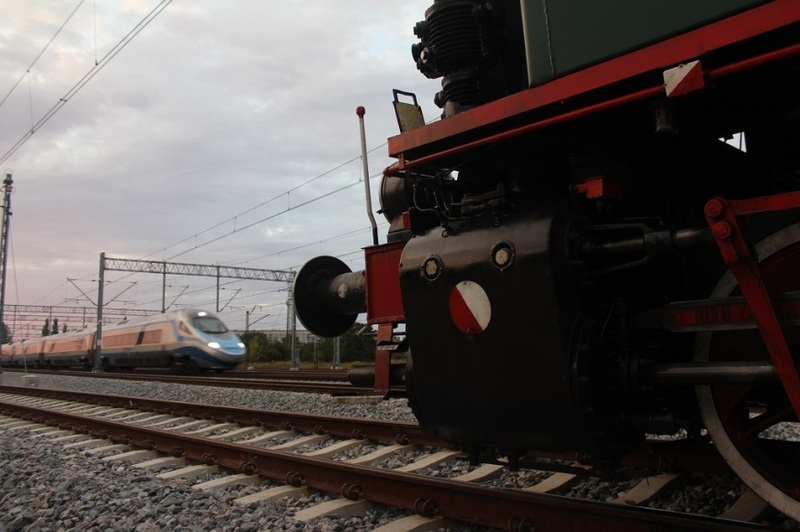 Given the rapid transformation of China’s railways over the last two decade it is remarkable that no meetings appear to have been held with Chinese locomotive and rolling stock manufacturers, or with Chinese railway construction companies. It is too early yet to judge whether the visit will succeed in its aims and improve relations between the two countries; a relationship which is still soured by mutual recriminations over the collapse of the Covec contract for building part of the A2 motorway. Pociag do Wielkopolski 23.7.2012 – rail enthusiast produced Wielkoplska province TV programme. 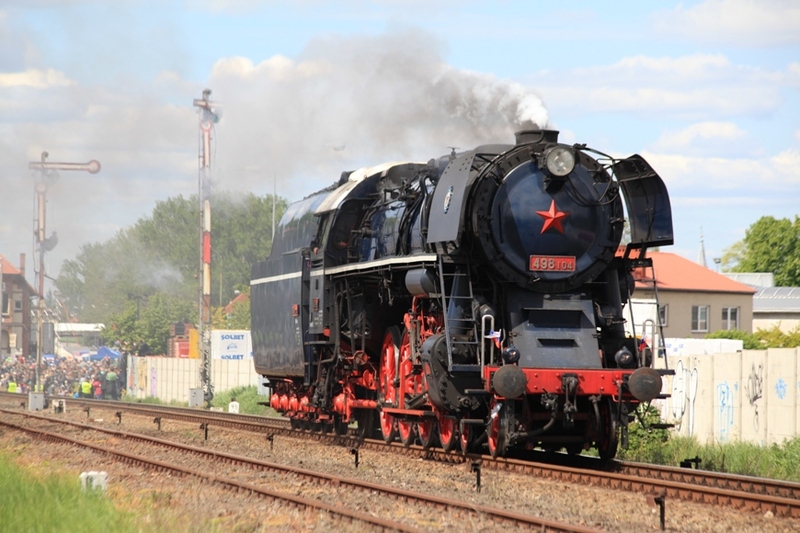 According to Andrzej Jablonski, a Director of the Wielkopolska Division of PKP Cargo, the company wants to maintain 4 working steam locomotives to maintain a reliable Wolsztyn-Poznan service and cope with steam specials. Major overhauls will be moved from Leszno to Chabowka where there is already a team of steam fitters based at the ‘skansen’. Jablonski wants to keep two of the Wolsztyn Ol49s in service and also Pt47-67. 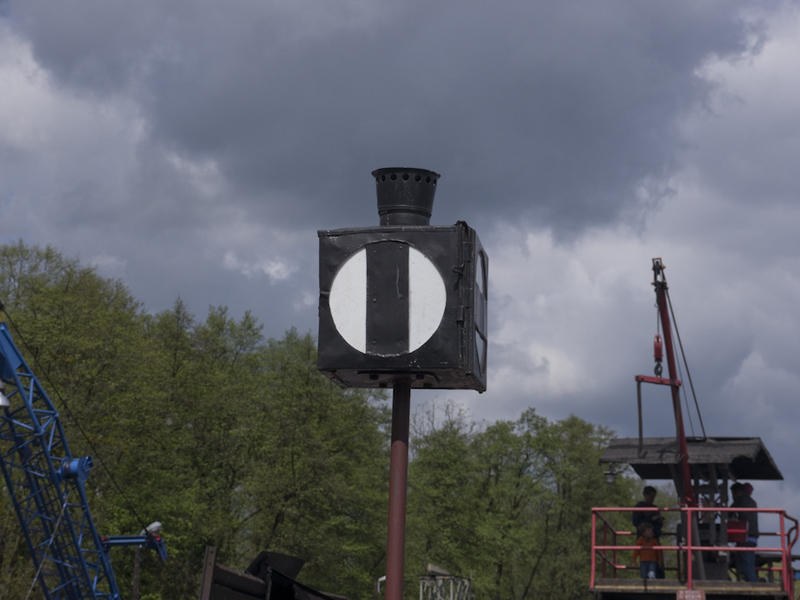 He also has his eye on Ol49-100 in Chabowka, which – although out of service since 2006 – is reported to have a good firebox. 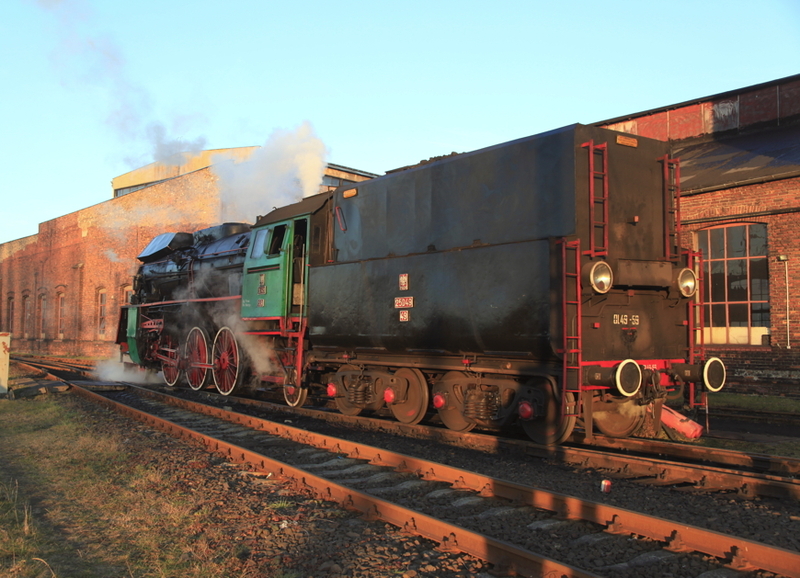 Jablonski also has a ‘wish list’ of locos that he would like to see in service which includes Warsaw Railway Museum-owned Pm36-2 Piekna Helena and 4-6-0 Ok1-359, but with the Pm36’s ticket due to expire (the loco will need a new firebox) and the Ok1 being not powerful enough for the Poznan turns, it is likely that, for the time being at least, his ‘wish list’ will remain just that. With a hat tip to Podroznik for the story. Jinan Railway Vehicles Equipment Co. C70 coal wagon. Photo JRVEC. PKP Cargo is planning to take delivery of three Chinese coal wagons and conduct tests as part of the process of obtaining Polish homologation. The wagons will be built by the Jinan Railway Vehicles Equipment Company Ltd in China. JRVEC is a wholly owned subsidiary of China CNR Corporation Limited which was formerly the Jinan Locomotive and Rolling Stock Plant. JLRSP was established in 1910 to repair steam locomotives and, consequent upon the withdrawal of steam haulage, the company branched out into the design and manufacture diesel locomotives. In 1993, the company further expanded its activities to encompass the design and manufacture freight wagons with the help of investment funds from the Chinese Ministry of Railways. JLRSP became JRVEC on July 9th, 2007. 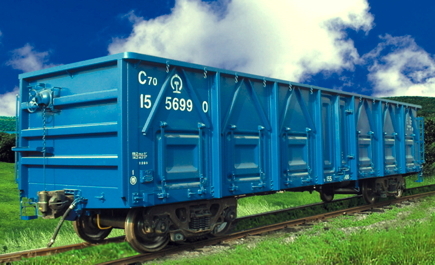 In June 2010 PKP Cargo and JVREC set up a joint venture CNR Cargo Wagon Sp. z o.o. with a view of testing the feasibility of importing railway freight vehicles wagons in CKD kit form from China and assembling them in a new facility to be set up in Szczecin. The venture was politically controversial at a time when many ex Cargo workers were being laid of at former PKP Cargo wagon works up and down the country. Also the feasibility study indicated that any competitive advantage was marginal when the costs of assembly in Poland were taken into account. The project was mothballed for a couple of years. Now the first three wagons have been ordered and will be tested to see if they meet Polish and European certification standards. If the test are successful a further 17 will be ordered in kit form to test the logistics and economics of assembly in Poland. What is the betting that the cheapest option will be to assemble the freight wagons in China? Swieta Katarzyna (Saint Catherine) is the patron saint of railway workers in Poland. 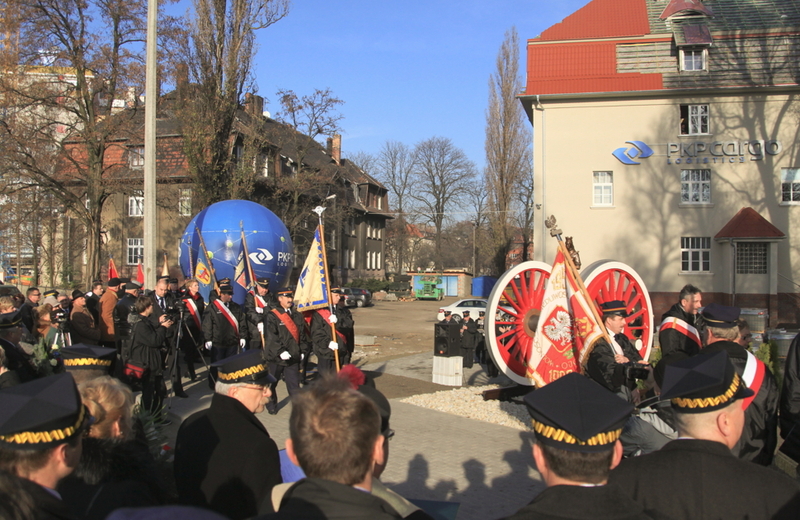 25 November, the saint’s feast day, saw PKP Cargo celebrate the rededication of their statue to Sw Katarzyna, in front of their offices at the rear of the Cargo shed in Poznan. Ol49-59, which had worked the morning train from Wolsztyn down to Leszno the previous day, had been buffed up to a shine, and worked light engine to Poznan that morning, in time for the celebrations. With brass band playing, and standards paraded, the statue was blessed, before the engine worked light back to Leszno in time for the scheduled afternoon train to Wolsztyn.